This time of the year means one thing to farm wives… harvest widow. For a few months every fall my husband is a tornado of work. If I do see him he is running for parts, fixing a combine, or cussing the rain. All the while he’s watching the price of corn and beans hoping for a good income. Farmers make their year’s salary over these few months and it is totally up to mother nature how much they will make. The only thing I can do to help him in this crazy time (since I’m not allowed to drive equipment for good reason) is to be there to help when he needs me to get parts, move him as he switches fields, and make sure he is fed. That last one is the hardest. My farmer doesn’t stop for anything…including food. So dinner has to be something that is one handed and quick. So all those great dinner recipes we fall back to go out the window. I turned to my fellow farm wives for ideas this year since I was sick of the stand by of hamburger, sloppy joe, and shredded chicken. Based on some great ideas I made up this tasty concoction last night! Melted butter in skillet and softened the onions. Added in garlic salt. Cut swiss steak into pieces big enough for buns and cooked it in the skillet on medium heat. I flipped it every once in a while and poured the Worcester sauce over the meat while cooking. I tried to keep the sauce and onions on the meat as it cooked. 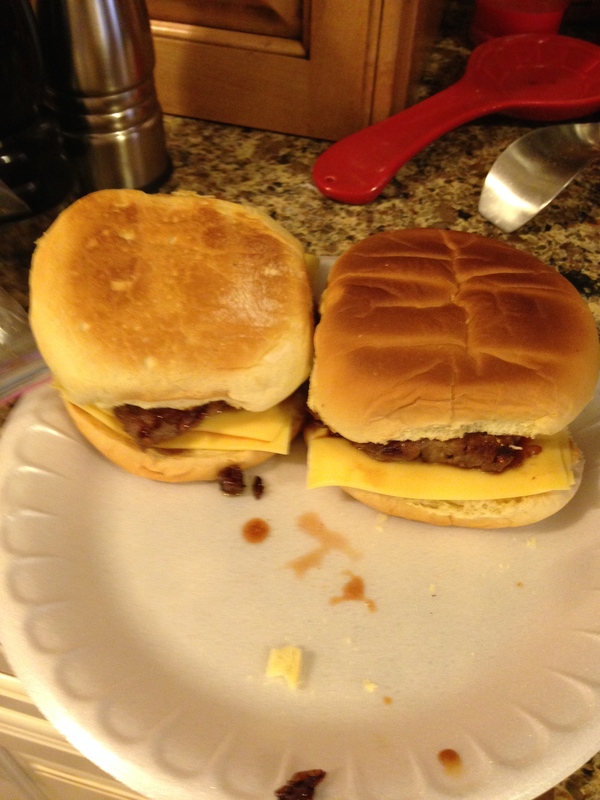 While it was cooking I toasted the buns and put slices of cheese on each bun. Put it all together and in a bag to head to the field. It had good reviews so I call it a success!